From September 19 to 22, a dozen Perini Navi sailing superyachts raced against each other in the seventh edition of a favorite event. Seven additional Perini Navi deliveries, a mix of sail and power craft, attended, too. 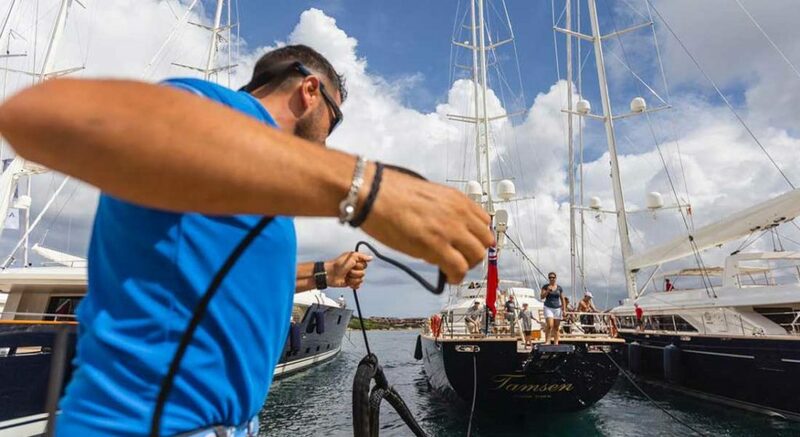 That’s what makes the Perini Navi Cup treasured by the builder’s customers. It brings together not just owners who want to race. It brings the brand’s enthusiasts, who feel much like family, together for a weekend of thrilling sights and shared experiences. From Aquarius to Victoria A, and from Blush to Spirit of the C’s, the 12 racers put on a good show. Mother Nature didn’t make things easy, though. Flat seas and strong winds pleased people on day one. On day two, however, the 7 knots of breeze that characterized the start dwindled down. It got to the point where race officials had to shorten the course. Unlike the 25 nautical miles of day one, the race covered just 10 on day two. Clear winners appeared by the end of the Perini Navi Cup, though. In the Cruiser Racer division, Silencio silenced her challengers. Meanwhile, in the Corinthian Spirit division, Maltese Falcon was victorious, just as she’s been in prior Cups. She took all three days’ races, in fact. Here are some of the sights and sounds from the event.